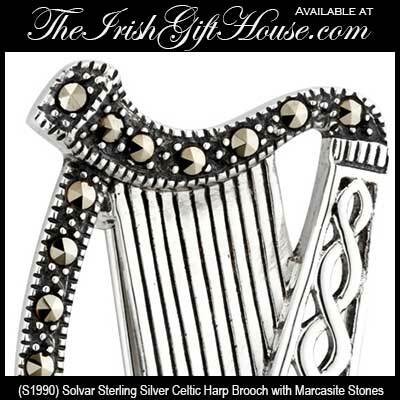 Irish harp jewelry is crafted as gold, sterling silver or plated designs. 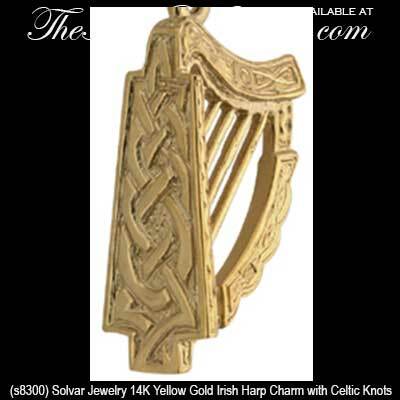 Select from harp necklaces and earrings along with Irish harp charms and brooches. Most of our harp jewelry incorporates Celtic knots into the designs and some of this Irish jewelry includes Connemara marble. The harp is an Irish national emblem and it appears on Irish coins and all official documents. The Irish harp has many distinguishing features such as the sounding box is carved from a single block of willow wood. Additionally an Irish harp has a T-shaped fore-pillar, a heavy neck and thick brass strings. These features combine to give the Irish Harp a unique sound for which it has been famous since medieval times. Irish harpists also had a special playing skill and were much in demand among the ancient kings for entertainment. 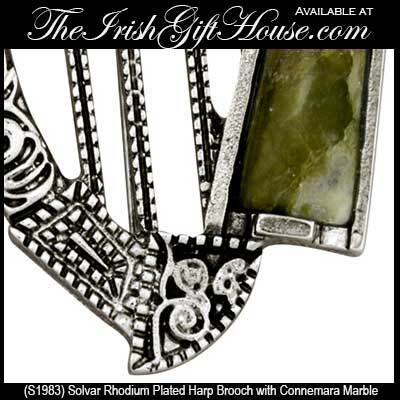 The Irish Gift House is proud to feature Irish made harp jewelry that is made by Solvar Jewelry. 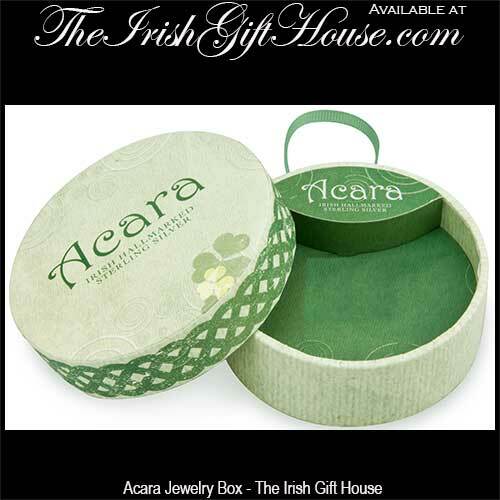 Harp jewelry is grouped by design in the above specific categories or you may scroll down to see all our Irish harp jewelry in one place. Gold Irish harp necklace features 14k white gold Celtic knots and strings. 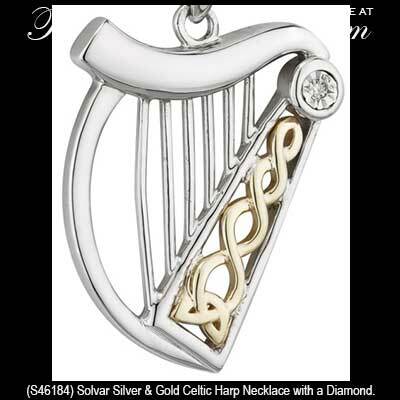 Sterling silver Irish harp necklace features a 10K gold Celtic knot design along with a diamond. This sterling silver Irish harp necklace features a gold plated Celtic knot design along with crystals. 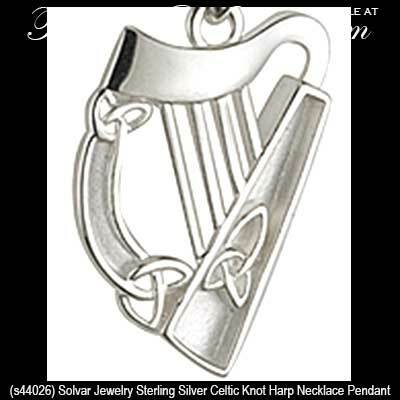 Sterling silver Irish harp necklace features a Celtic motif with included Trinity knots. 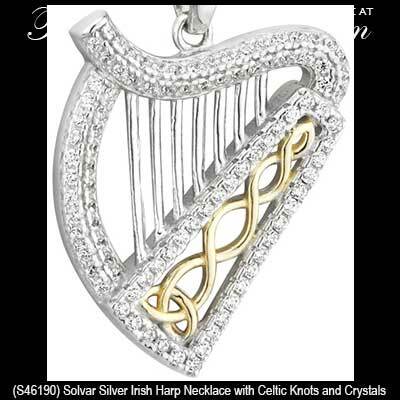 Irish harp necklace features rhodium plating that is enhanced with inlaid Connemara marble. Irish harp necklace features sterling silver construction that is enhanced with engraved Celtic knot-work that includes the Trinity. Irish harp necklace is a rhodium plating design that is enhanced with inlaid Connemara marble. 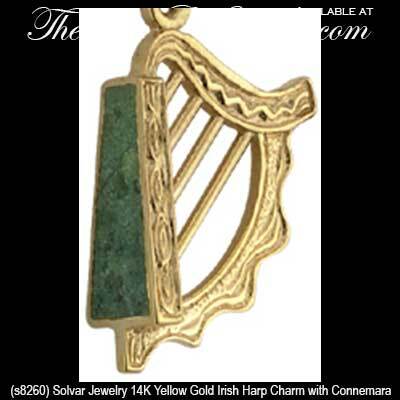 Irish harp necklace is a gold plating design that is enhanced with inlaid Connemara marble. Irish harp necklace is a gold plated design that is enhanced with green glass stones. Irish harp necklace features a gold plated finish with enamel accenting along with a Celtic knot design. Irish harp pendant features a gold plated finish with enamel accenting along with a Celtic knot design. 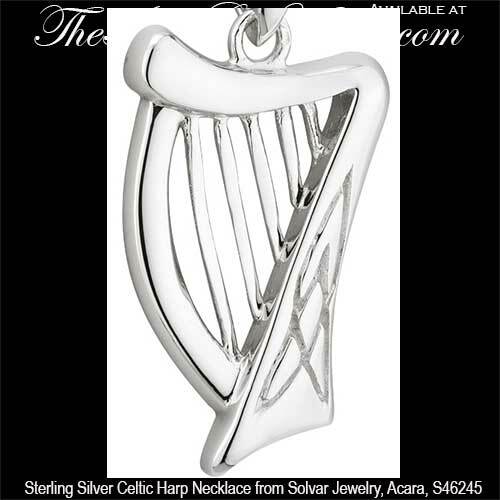 Sterling silver Irish harp necklace is a tiny design that is enhanced with a Trinity knot. 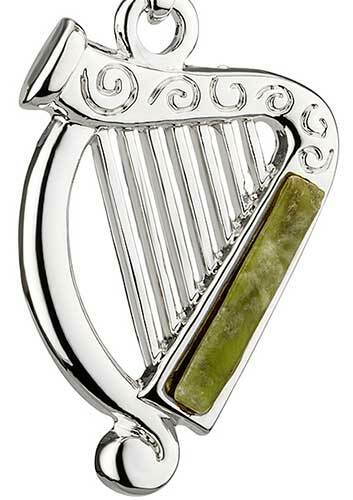 Irish harp pendant is a silver plated design that is enhanced with green glass stones. Sterling silver Irish harp necklace is a delicate design that features an engraved Trinity knot. This silver plated Irish harp necklace is enhanced with green and white glass stones. This silver plated Irish harp necklace is enhanced with green enamel accenting along with crystals and a Trinity knot. This large Irish harp charm in 14K gold features an elaborately engraved Celtic knots. 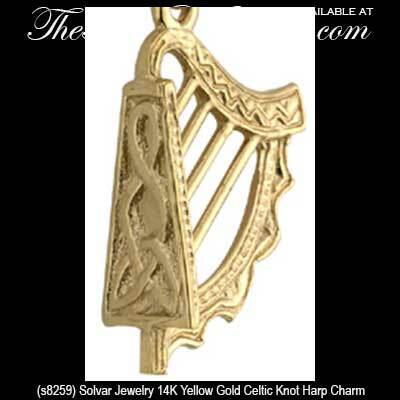 Solvar Irish Jewelry, 14K Two Tone Gold, Irish Harp Charm with Celtic Trinity Knots. 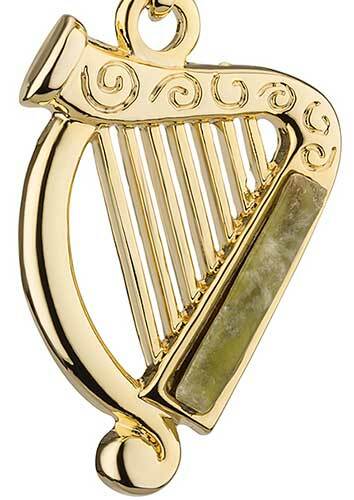 Harp charm features engraved 14K gold that is enhanced with inlaid Connemara marble. 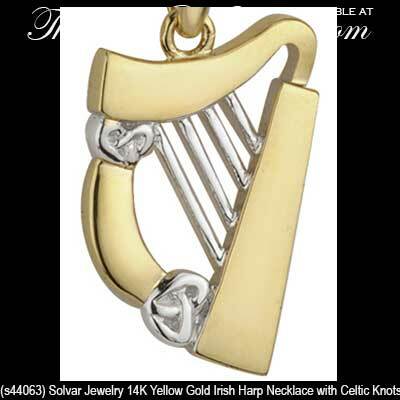 This 14K gold Irish harp charm features an engraved Celtic motif that includes the Trinity. This small 14K gold Irish harp charm features engraved Celtic knot-work that includes the Trinity. 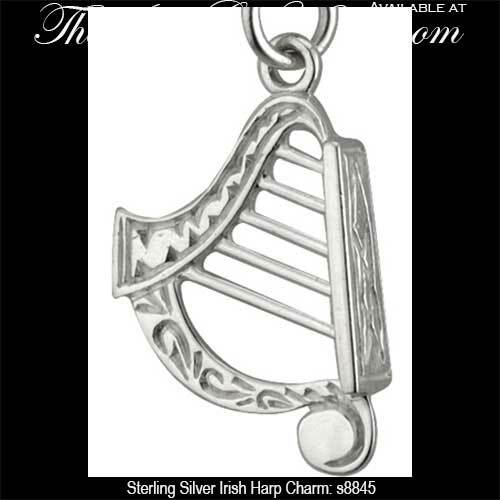 This sterling silver Irish harp charm features a lobster claw catch and is enhanced with an engraved Trinity knot. 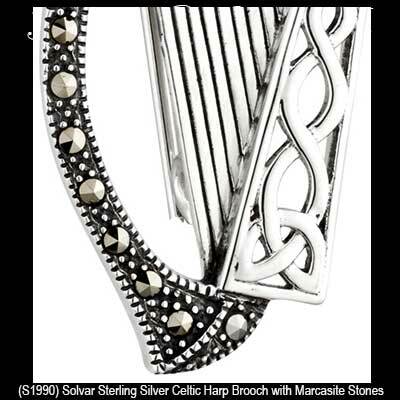 Irish harp brooch features sterling silver construction that is enhanced with Celtic knot-work along with marcasite stones. 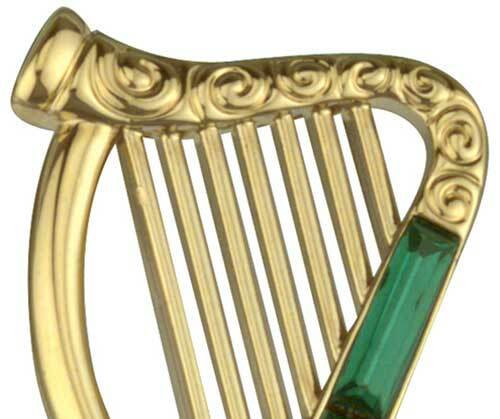 Irish harp brooch features a gold plated finish along with green glass stones and embossed detailing. Sorry, this harp brooch is now sold out. 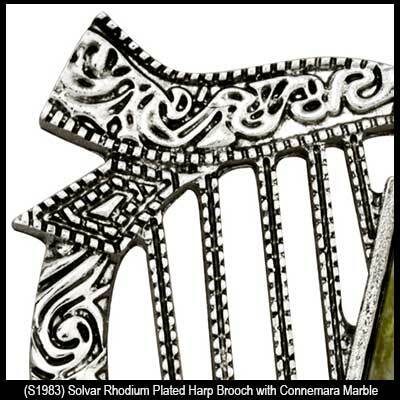 Irish harp brooch features inlaid Connemara marble along with embossed detailing. This assortment of Irish harp jewelry is just one of the many collections of Irish jewelry that we offer at The Irish Gift House. If you enjoyed browsing through this section you may also like to see our St. Brigid's crosses that we offer as necklaces and charms. Another category that is strictly Irish jewelry, and not Celtic jewelry, is the History of Ireland collection that is made by Solvar; these pieces feature icons that respectively represent an era of Ireland's past. For the sake of comparison it was the Celts that believed that trees held mystical powers and that they are the foundation of life, so our Tree of Life jewelry, that includes necklaces and earrings, is categorized as Celtic jewelry. The Celtic Cross falls in between the Irish and the Celtic, some may say that it is both. Certainly there is early evidence of their existence in every Celtic nation but according to popular legend it was during the 8th century that St. Patrick who first introduced the Celtic version of the Christian cross to the then pagan Irish. Anyway, we have so many items in this section of our site, such as the silver Celtic cross necklaces and the men's Celtic cross necklaces, that we created a separate category where you will also find Celtic wall crosses and their common Irish cousins, the standing Celtic crosses.